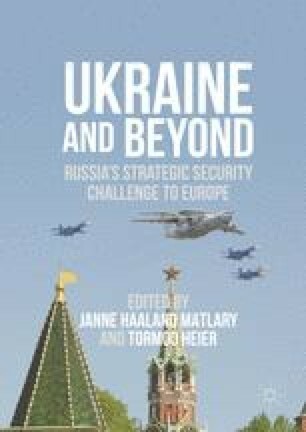 The present situation in Europe has raised concerns about whether the USA still has the will to provide security to European allies through extended deterrence.1,2 During the Cold War, countries within Moscow’s reach sought NATO membership solely for the “safe haven” of NATO’s article 5. Participation in international military operations was not the driving factor. The expense of NATO membership was merely a means to that end, seen as an investment in a security deposit one could draw upon in harder times. Few today envisage a US or NATO nuclear retaliation as a response to Russia’s interference in e.g. a Baltic country, as mentioned by Christopher Coker in Chap. 2 and discussed in some more depth by Julian Lindley-French in Chap. 6. However, nuclear weapons do frame any power-play involving NATO and Russia, and the issue of nuclear deterrence is still something to be reckoned with. Pedlow, Gregory W. 1997. NATO Strategy Documents 1949–1969. NATO Archive Web. Accessed March 1, 2006. http://www.nato.int/docu/stratdoc/eng/.